The Wabash Apache football team got back to its winning ways Friday, trailing at halftime before pitching a shut out in the second half in a 29-14 win over North Miami. The Warriors would take the early lead when Trevor Linn scored from 8 yards out with 8:45 left in the opening quarter to lead 7-0, but the Apaches would respond just two minutes later when Owen Yeadon scored from 21 yards out with 6:47 on the clock to knot the score at 7. NORTH MANCHESTER -- The Running Rivers Confrence and Three Rivers Conference cross country meets were held at Manchester Saturday with several county teams and runners having a great day. In the boys RRC Wabash’s Derek Vogel was the individual champion with the team finishing second. Southwood was third and Northfield fourth. Manchester had an incomplete team. For the first time in school history the Northfield football team started the season 6-0, defeating Rochester for the first time in 20 years and just the third time ever 35-12 Friday night. The fireworks started right off the bat when Rochester went 73 yards on the first play from scrimmage to grab a 6-0 lead. The Norse would respond though. On second and 11, quarterback Drake Richter pitched to Jared Short who then found Dylan Brown wide open for a 61 yard score to give Northfield a 7-6 lead just a minute and 9 seconds in to the game. Rochester would come right back, running 13 plays and taking up five minutes for their second score to take the lead back 12-7 which is where the first quarter ended. The Wabash football team got off to a very slow start Friday, falling behind 21-0 to Peru before coming back and falling short 21-20. After a scoreless first quarter the Tigers would strike three times in the second in a 5½ minute span go grab a 21-0 lead. The Apaches answered with 3:10 left in the half on a 30-yard pass play from Sammy Hipskind to Eryk Weber to make it 21-7 at the half. The Southwood volleyball team made their second trip of the week to play a county opponent Thursday visiting the Wabash Lady Apaches. After a close first game the Knights would get it going in a 25-23, 25-13, 25-15 win. The Lady Apaches came out swinging in game one, not showing any intimidation for the Knights. Taking advantage of some Knight errors while getting a kill from Brooke Irgang and an ace from Alexis Hartley the Apaches led 5-4 and had the lead at 11-8 when Southwood got kills from Bailey Lundmark and Drue Gentry to knot the score at 11. Wabash would then get two kills from Sydni Mullett and one from Sam Irgang to grab a 17-13 lead before the Knights answered with five straight to go up 18-17. During the run Drue Gentry had an ace with Emilie Harnish getting a kill. With the Knights leading 20-19 Wabash would get a kill from Kristin Cromer during a 3-0 run to go back up 22-20 and led 23-21 when Harnish and Lundmark took over at the net to score four straight for a 25-23 Southwood win. The IHSAA has announced the pairings for the upcoming boys’ and girls’ soccer sectionals. Host Fort Wayne Blackhawk Christian will play Manchester at 5 p.m. Oct. 7. The Southwood football team carried its momentum from last Friday’s win over Wabash onto the field Friday against Whitko, scoring in the fourth to grab a 21-20 win over the Wildcats for their third straight win. The Knights grabbed the lead in the first quarter when Joseph Brinson picked up a Whitko fumble and raced 52 yards for a score and a 7-0 lead. WESTVILE -- The Northfield varsity volleyball team traveled to Westville Saturday for the Blackhawk tournament, going 3-0 on the day to capture the tournament. The first match of the day for the Lady Norse was East Chicago and the Lady Norse won 25-4 and 25-8. Their next match was against Oregon-Davis, winning 25-9 and 25-18. 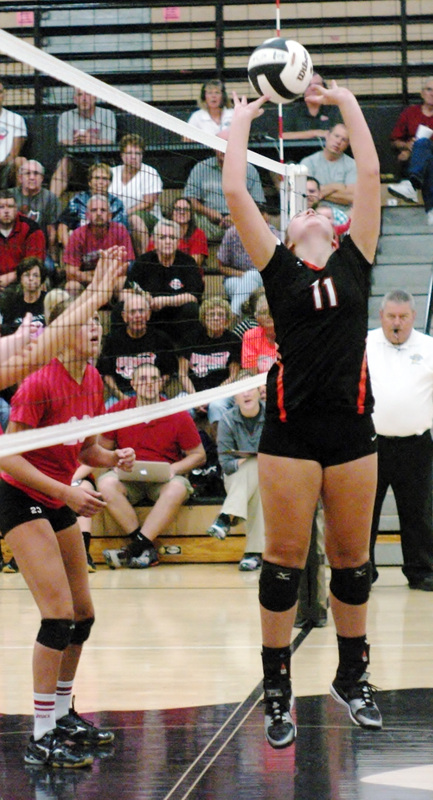 In the Championship match the Lady Norse faced the host school Westville Blackhawks. This match went three games as theBlackhawks won game one 16-25, but the Lady Norse came back to with the next two games 25-12 and 15-6.